Niki was my perfect college roommate. No one else (except perhaps my own mother) would have put up with my shenanigans the way she did. We gossiped and adventured our way through our first and second years at UC Santa Cruz. We were a slightly peculiar duo that had somehow been matched together through the magic of Porter College’s roommate pairing system. There were theories that we were paired together based on religious affiliations and our preference for show tunes. Whatever the logic, I am forever grateful to have met her. During our time there, Niki met a fellow film major named Patrick and the two little otters fell in loooooove! 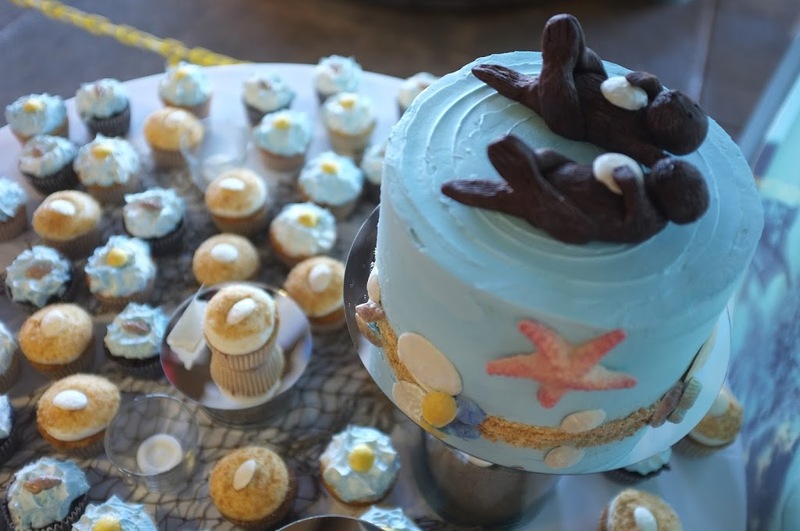 Many years later, the inevitable happened, and Niki asked for a beach-themed wedding cake. “But not kitschy,” she insisted. “I don’t want umbrellas and flip-flops.” I was relieved, but not surprised by her request. Kitschy is for little kid birthday parties. My goofy, wacky roomie was definitely not kitschy. We decided upon otters, sand, and seashells with delicate colors to compliment the earthiness of their chosen flavor, carrot cake. The resulting design looked like Santa Cruz. Naturalistic, earthy, and fun. 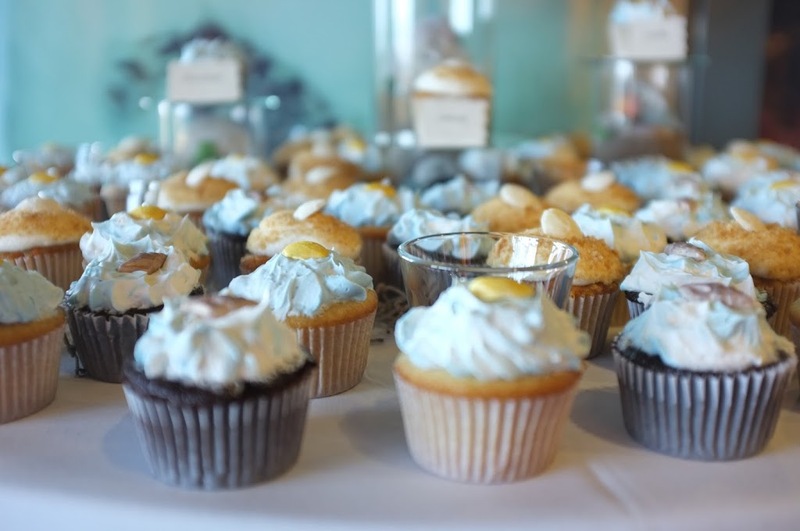 Talk about ticking things off the to do list, Niki had found a baker and an officiant in the same place, and Cake Done Right had become their one-stop wedding shop! I would now be officiating the ceremony as well. After the real ceremony, signing paperwork. This pretty much describes our entire relationship. The ceremony was held at the Seymour Marine Discovery Center in Santa Cruz, CA. 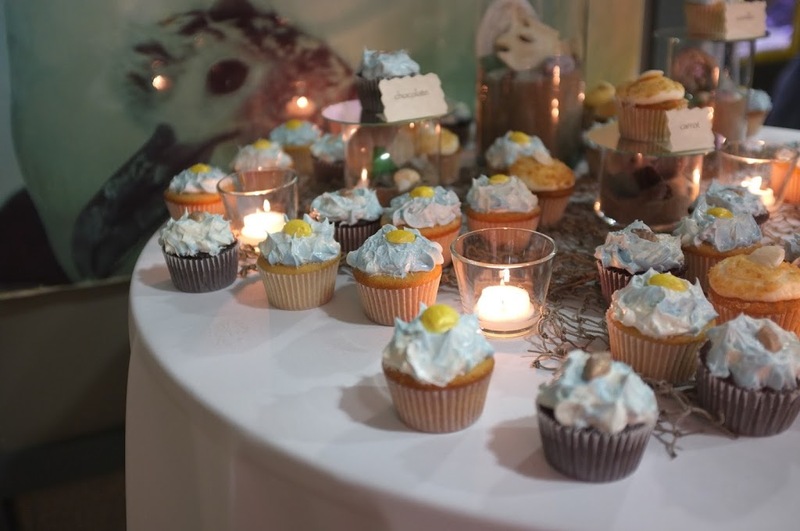 As badly as I wanted to set up the cake table in front of a beautiful, giant, saltwater aquarium, it would not have been safe for the fishes if the table had gotten knocked over. So we moved it in front of a giant picture of a seagull with her chick. 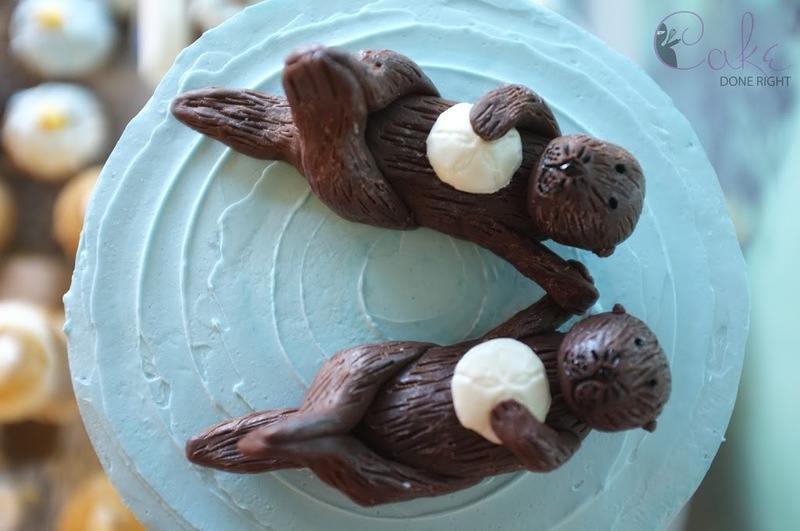 The otters were hand sculpted out of chocolate and were not eaten during the ceremony because they were just too cute. They might even still be in the freezer. Baby Moon Jellies! The largest one was only about 1/2″ wide. So wee! Nerds on the dance floor. Good times. Girl, I love you so much it hurts. Thank you for being a part of my life and inviting me to be SO involved in your big day. Wishing you and Patrick a lifetime of happiness! I make observations about the human experience. I also make art out of cake… Because art and cake are both very important to the human experience. My name is Allison, and I will be your Cake Ninja. Please enjoy your stay!